Travelling along the scenic coast road, the Captain Cook Highway, north of Cairns for approximately 45 minutes, and you will come across one of the Tropical North’s true treasures. 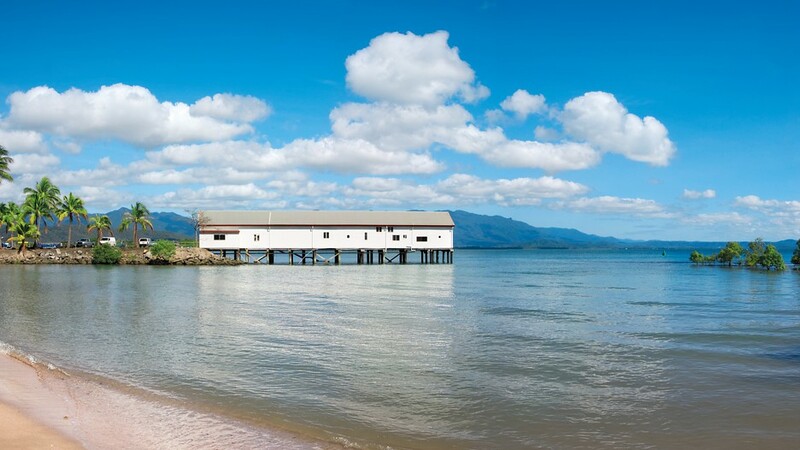 Once a sleepy little fishing village, Port Douglas came of age in the late 1980’s following the construction of the award winning Sheraton Mirage. This luxurious 5 star resort put this town on the international tourist map and it has been growing at an exceptional rate ever since. Nowadays you can find many and varied accommodation houses to chose from, luxury resorts, self contained apartments, motels and exclusive executive houses overlooking palm fringed Four Mile Beach. ‘Port’ has it all. 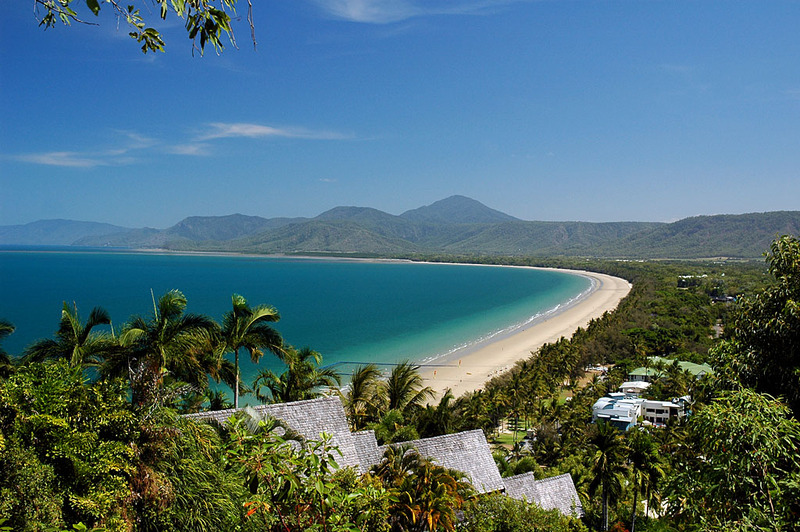 Port Douglas occupies a small peninsula bounded by Four Mile Beach on the seaward side and Dixon Inlet, a mangrove lined tidal estuary, to the west. The lifestyle here is very relaxed. A place to just laze about, walk to the beach, ride a bicycle to town and dine in one of the acclaimed restaurants. Fishing options are within easy reach and a stroll to the town foreshore will yield several opportunities to wet a line, although Four Mile Beach itself has never really been known as a hot spot. At the mouth of Dixon Inlet is Anzac Park, also known as The Old Stinger Enclosure due to it originally being a man-made rock wall protecting a sheltered swimming beach from box jellyfish. The area behind the rock wall has since been filled in and it is now a very pleasant area of parkland with rock faces dropping off to the water on 3 sides. Anzac Park is a great place for family fishing having plenty of room for the kids to run around in, playground equipment, picnic tables, shade from beautiful big trees, easy parking, and a stones throw from the centre of town, and the Courthouse Hotel. The rocky edges of Anzac Park can be fished by the avid lure fisherman as well as by standard baitfishing methods. The period around the tide change is the most productive, but even if you don’t have much luck, the view north along the sweep of coast to the Thornton’s Peak and the Daintree Range is worth the effort, particularly as sunset approaches. After heavy rainfall during the summer months bait fish flushed from Dixon Inlet seek shelter amongst the rocks. The predators like Barramundi, Jacks and Fingermark will follow and luring techniques as described under the “Rocky Headland” section also apply here. The small wharf at Ben Cropps Museum is also an excellent spot to try your luck, and standard bait fishing rigs are preferred here. From Ben Cropps wharf back to the Marina Mirage, any structure within the system will hold bait. The pylons and jetties along this stretch are an excellent location to gather bait fish, and try your luck with a lure. Barramundi are caught here during the summer while GT’s and Queenfish are winter targets. Several of the wharves through here are private property so any ‘No Trespassing’ signs should be respected. The Marina itself is a good location but it’s always best to check in with the Marina Management first. If you do fish within the Marina environs, stay away from the busy charter and cruise boat berths, like Quicksilver, particularly when they are leaving in the morning, and returning and unloading passengers at 4.30-5.30pm. Dixon Inlet itself is probably the most productive area to fish in Port, but a boat is a must. Outboard dinghies are available from Port Douglas Boat Hire they will certainly help you out in getting set up for the day’s fishing. Although just 12ft runabouts, the dinghies have been fitted with shade covers mounted on PVC tube frames making them quite comfortable for a whole day out in the sun. Taking your own boat doesn’t present any problems either with a broad shallow boat ramp available on Dixon Inlet. It is right next to the Combined Club which is a great place to wait for the tide to turn, or to practice getting your fishing stories right with your mates at the end of the day. It’s a locals pub (not a tourist hangout) and the atmosphere is nice and casual and the food is great (and cheap). Always remember that these sort of places are where the locals go to get a break from the ‘out-of-towners’ so just pretend that you’re in your own local back home, and don’t tell too many people about it. Dixon Inlet has a resident population of crocodiles and other nasties which must be respected, but it is a very peaceful waterway that local charter operators also work, and surprisingly good captures are consistently made. This tidal estuary has all the usual characteristics, fishing methods and bait gathering techniques so use the tides to your advantage fishing shallow water on the big tide cycles, and the deep water and more structured areas on the neaps. Live or fresh bait is more productive than smelly old frozen prawns or pilchards, but fresh bait is a bit hard to get in Port and you might be advised to take some with you if you are travelling up from Cairns. Fishing gear and a few local tips are available from Ship Shape, a chandlery at the Marina end of Warner Street.